As members of the National Federation of the Blind, we know how powerful mentoring can be. Connecting with someone else, particularly another blind person, has the potential to change someone’s life. There are many tools we can use in combination to help these relationships grow, even if the person you want to communicate with doesn’t happen to live in the same city. Often connections are made at events, and people keep in touch via phone, email, or good old-fashioned snail mail letters. A couple of years ago I realized that there is a new implement we can add to our toolbox. In May of 2013, the National Federation of the Blind of Nebraska Omaha Chapter decided to participate in Omaha Gives, the city’s local giving day. A giving day is a chance for everyone in a community to focus on donating to local nonprofits. The organization sponsoring the giving day frequently allocates funds to be given out to each of the participating organizations based on the percentage of funds they raise, which means a donor’s money goes even farther. The Lincoln Chapter had participated in a giving day the year before, during which we raised more than $2,000 by reaching out to donors on Twitter and Facebook. Consequently, I knew that social media could be an incredibly powerful way of reaching out to potential donors, and when the chapter president asked me if I would be willing to help boost the organization’s profile on and leading up to the day, I enthusiastically agreed. Early on the morning of the event I saw a donation come in from someone named Jess, a donor whose name I didn’t recognize, followed by a tweet mentioning us and the importance of Braille literacy for blind children. Thrilled with our increased visibility, I messaged them on Twitter asking who they were and how they found out about us. To my delight, they had found us by following the hashtag for the giving day, and our mission spoke to them because they were losing their vision. I wrote back, thanking them for their donation, telling them a little about myself and the National Federation of the Blind, and asking about them as a person. As I would have in a traditional face-to-face conversation, I didn’t only ask about their blindness, in fact at first I rarely mentioned blindness. Instead, I asked about their hobbies, their likes and dislikes, and other typical getting-to-know-you questions. I replied to tweets they posted about the books they were reading or the vacation they were planning. Over the next year Jess and I continued to correspond via Twitter, and Jess began to talk about their feelings about blindness. I came to realize that they were more comfortable talking about their struggle online. I was safe because I was anonymous and didn’t judge them or their feelings. I discovered that my new friend was something of a weather enthusiast and connected them with my blind partner who participated in storm-spotting events using ham radio. I listened as they lamented the loss of their vision and the perceived loss of so many hobbies that they cared about. Sometimes I offered an alternative technique that would allow them to continue participating in a hobby, like art. Sometimes we talked about hobbies we had in common; it turned out we both enjoy knitting. Sometimes I simply provided a listening ear, someone on the other side of the keyboard who understood blindness and who was still living the life I wanted. 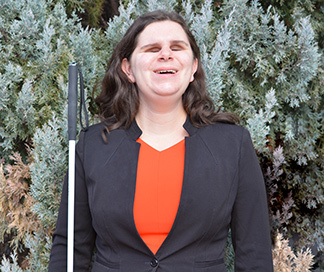 During this time, Jess connected with the Nebraska Commission for the Blind and Visually Impaired and began taking travel classes. I cheered them on, continuing to use Twitter to celebrate as they began realizing that blindness didn’t have to be the end of their independence, commiserating on the days when they weren’t sure they could accomplish the tasks they had been set, and celebrating when, ultimately, they mastered the skill and continued to build their self-confidence. About a year and a half after we started talking, my partner and I were headed to Omaha for a family event. Realizing we had some extra time to kill, I reached out to Jess and asked if they were interested in getting together for coffee or a bite to eat. As someone who isn’t always the most socially confident, this was something that made me incredibly nervous, but I was at least ready to have a conversation in person. We agreed to meet at a local pizza shop we both liked. Though we were both nervous, we spent an enjoyable hour and a half eating and talking. After that our conversations on Twitter became deeper and more frequent. Later that fall the Omaha chapter decided to host a chapter building event in conjunction with the state convention. I knew Jess was nervous in groups of people, but I decided it was worth inviting them again. I thought that since we had already met in person, the fact that I would be attending the event might make it easier. Though they were hesitant, they agreed to go, and we set a time and place to meet up beforehand. We also exchanged phone numbers for the first time. The night of the event, I introduced Jess and their partner to as many members of the National Federation of the Blind of Nebraska as I could. I was thrilled to see them connecting with other blind people who shared a positive philosophy about blindness. I watched as they talked to blind parents, blind students, and blind professionals. They ended up staying at the event longer than I anticipated and kept talking with others long after I was called away. Over the next few months my Federation family also began to reach out to Jess. Eventually they attended their first chapter meeting and took on leadership responsibilities, including being a chapter board member. The following year Jess was the one planning the social media strategy for the giving day, the event that had gotten them involved in the first place. Twitter is not the only reason Jess got involved in the National Federation of the Blind. However, in this case, it was the right tool to use to reach out to them and connect with them where they were at the time. Jess is someone who generally talks more freely online than in person, and the anonymity allowed them to feel comfortable talking about something they hadn’t yet come to terms with. It also allowed me, someone they may never have met in person, to show them that blindness did not have to hold them back. Getting started with Twitter does not have to be overwhelming. All you need to begin is a user name, a password, and a couple of people to follow. My username is kea_anderson. You can also connect with President Riccobono, @riccobono, and the National Federation of the Blind, @NFB_voice. In today’s digital age, our social interactions seem to happen more and more online. This is either a blessing or a curse, depending on who you talk to. Social media does have the potential to be a powerful recruiting tool for us as Federationists, provided we use it as one of many instruments in our toolbox.